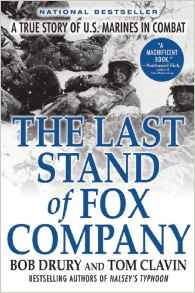 If you want to read more about part of the battle around the Chosin Reservoir then this book is an excellent and detailed account of the siege of Fox Company of the Seventh Marine Reservoir. This Company was besieged for several days by much numerous Chinese troops but with the courage and determination the American held on against the odds. The book was written by Bob Drury and Tom Clavin and is published by the Atlantic Monthly Press.